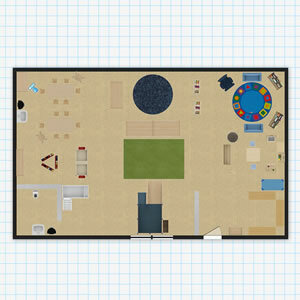 Create your dream classroom with the MyKaplan Classroom FloorPlanner! Our free online classroom design tool can help you arrange your space and see how your favorite Kaplan products fit into the classroom. Enter the exact dimensions of your classroom, and then simply drag, drop, and rearrange products until you are happy with the result. Our 3D renderings give you a realistic view of what your classroom will look like. When you are ready to make your virtual dream classroom a reality, order online or contact your local Kaplan representative for final planning advice, list adjustments, and budgeting options. 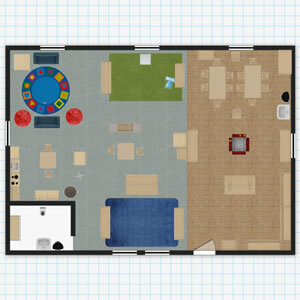 FloorPlanner is an easy and convenient way to create interactive floor plans of your classroom and share them online. Log in to your MyKaplan FloorPlanner account to access any floor plans you have saved or are currently developing. 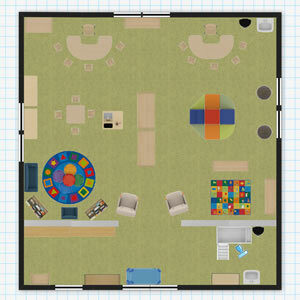 The infant classroom floor plan is designed for up to 8 children, ages 6 weeks to 12 months. 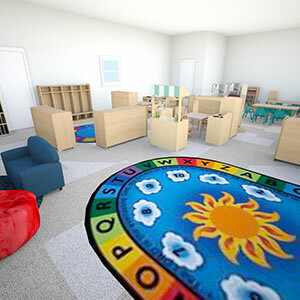 The classroom floor plan is designed to support ITERS-R criteria and NAEYC accreditation standards and provides ample space for activities with allowance for normally excluded areas, such as doorways, built-in sinks, etc. It includes areas for routines (diapering, meals/snacks, nap/rest, etc.) as well as play spaces for activities with various materials, including books, music and sound making toys, fine motor toys, gross motor toys, blocks, and dramatic play materials. This room is outfitted with basic furniture and equipment. 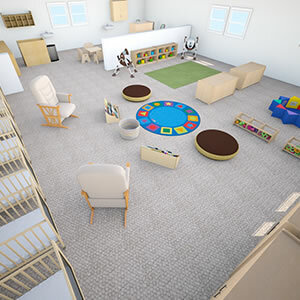 The one-year-old classroom floor plan is designed for up to 10 children, ages 12 to 24 months. 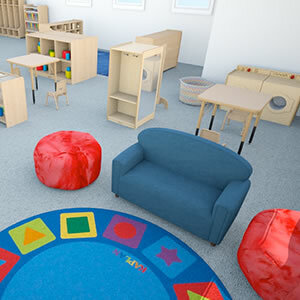 The classroom floor plan supports ITERS-R criteria and NAEYC accreditation standards and provides ample space for different types of activities with allowance for normally excluded areas, such as doorways, built-in sinks, etc. It includes areas for routines (diapering, meals/snacks, and nap/rest, etc.) as well as play spaces for activities with various materials, including books, music and sound making toys, fine motor toys, gross motor toys, blocks, and dramatic play materials. This room is outfitted with appropriately sized furniture and equipment that support the children's independence. 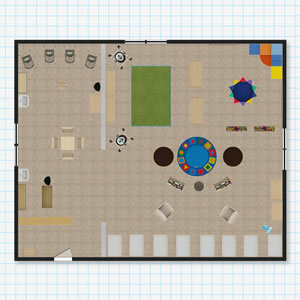 The two-year-old classroom floor plan is designed for up to 12 children, ages 18 to 36 months. The classroom floor plan provides ample space for a variety of activities with allowance for normally excluded areas, such as doorways, built-in sinks, etc. It includes areas for routines (meals/snacks, nap/rest, etc.) as well as play spaces for activities with various materials, including books, music and sound making toys, fine motor toys, gross motor toys, blocks, and dramatic play materials. It is outfitted with basic furniture and equipment. 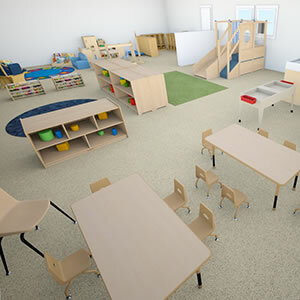 The three-year-old classroom floor plan is designed for up to 12 children, ages 36 months to 4 years. 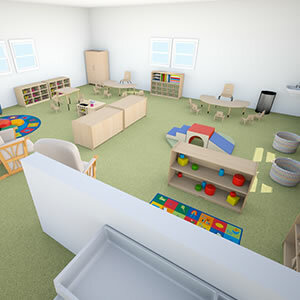 The classroom floor plan is designed to support ECERS-R and ECERS-3 criteria as well as NAEYC accreditation standards. Additionally, the floor plan provides ample space for a lot of different types of activities with allowance for normally excluded areas such as doorways, built-in sinks, etc. It includes areas for routines (meals/snacks, nap/rest, etc.) as well as many different types of interest centers (blocks, art, sand/water, dramatic play, science, computer, literacy, manipulatives/fine motor) for a variety of learning and play opportunities. It is outfitted with basic furniture and equipment. 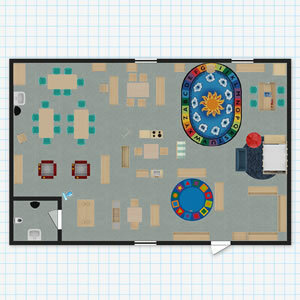 The Pre-K classroom floor plan is designed for up to 18 children, ages 4 to 5 years. The floor plan supports ECERS-R and ECERS-3 criteria as well as NAEYC accreditation standards. Additionally, the floor plan provides ample space for different types of activities with allowance for normally excluded areas such as doorways, built-in sinks, etc. It includes areas for routines (meals/snacks, nap/rest, etc.) as well as many different types of interest centers (blocks, sensory, art, fine motor, dramatic play, science, math, computers, literacy, manipulatives/fine motor, writing/listening) for a variety of learning and play opportunities. It is outfitted with basic furniture and equipment.